When I called in, I was immediately put in contact with the agent that was able to answer all of my questions. He was knowledgeable and very polite. The gentleman was well versed on every aspect of the business. RPPH offers a price point of $12 for Internet only and $18 for phone service. 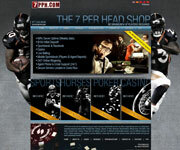 Casino and poker action are included in the price with a commissions off the rake or player loss. The software package itself is very impressive and quite unique from many of the other services we checked out. The agent page has more reports than any other site we tested. The site itself had a decent amount of information, but not everything I needed. After gathering what I could from the site, I called in to verify information and have the questions answered that were not available. I should also note at this point that some of the navigation on the site can be a bit tricky and I would imagine a novice could get a bit frustrated.Upon calling, the phone was picked up immediately. However, when I made my first inquiry, I was put on hold for about two minutes while I was transferred to an agent that could answer my questions. The gentleman who answered was pleasant enough. He spoke English, but was obviously a foreigner and it took a bit of straining to understand everything he was saying. Upon calling, phone was immediately answered by an English-speaking representative. He was extremely friendly and very helpful in providing information about the company. It offers a great opportunity for bookies that are looking to move their operation online that do not need all the bells and whistles. There is a flat fee of $7 per player for Internet access, but no call center is available for players. If bookies have old-timers that want to place calls, the agent can do it in the website with no problem. This price is unbeatable for any bookie that knows their players will not mind using the Internet. This was probably the most frustrating experience of all the sites. The site has information, but no pricing. When I called in to get the information, the person who answered the phone did not speak very clearly, nor did he bother to put me on hold while he asked around. All I could hear were murmurs of "Can somebody take this guy?" Another agent grabbed the phone and while he was a native English speaker, he had little to offer in terms of information. Upon calling into the 800 number, I was immediately connected to a native English-speaking agent that was polite and knowledgeable. There was no hard sell involved and he was able to answer all of my questions. The company offers two prices points of $10 for Internet only players and $13 for players also using the call center. RNG casino action is available and is included in the price of the sports betting. The company also offers separate poker action, but a post up must be made for the players to be able to play in the poker room. Agents are paid a commission on the rake the player generates.